NATIONWIDE: People are invited to light candles to mourn the passing of King Bhumibol Adulyadej tonight (Nov 14) when a full moon coincides with the Moon’s closest approach to Earth in 68 years. 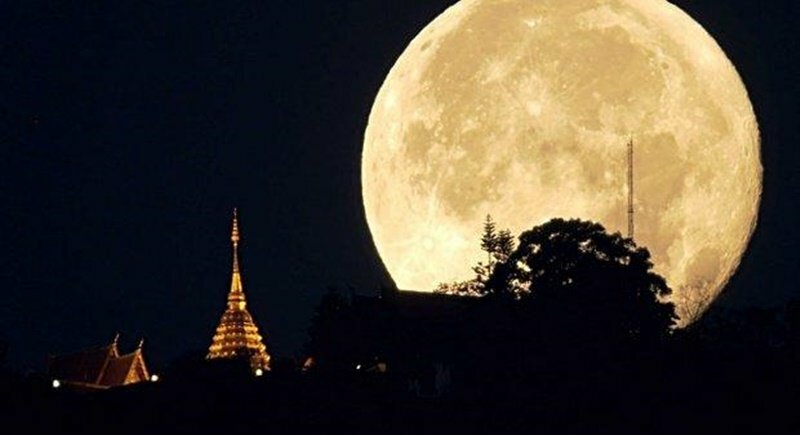 The Moon will be 356,511 kilometres from Earth today, creating a “supermoon” that also coincides with the Loy Krathong Festival, according to the National Astronomical Research Institute of Thailand (Narit). The institute has arranged three key observation sites in Chiang Mai, Nakhon Ratchasima and Chachoengsao. Other groups also will hold activities across the country where telescopes will be provided for spectators. According to Narit, people in Chiang Mai are invited to attend the candlelight vigil for the King at the plaza in front of Central Festival Chiangmai in Muang district tonight. Narit Deputy Director Saran Poshyachinda said the full moon will be the closest to Earth it has been since Jan 26, 1948. The Moon on today will look 14 per cent larger than it looks at its farthest distance from Earth and 30% brighter. The Moon’s elliptical trajectory brings it close to Earth every month, but not always as a full moon, Mr Saran said. The Moon only orbits closer to Earth as a full moon every 13 months and the next occasion will be on Jan 2, 2018 when it will be 356,656km from Earth. In Chai Nat, a large moon and an array of stars were clearly visible before sunrise yesterday (Nov 13). People are hoping the sky will be clear tonight to observe the supermoon. Meanwhile, a crowd of black-clad mourners arrived at Sanam Luang yesterday, where they queued to pay homage to King Bhumibol at the Grand Palace to mark the one-month anniversary of his passing. Authorities expected crowds larger than normal arriving to mark the occasion. People were allowed to enter the Grand Palace at 5am, though mourners started queuing on Saturday night. Security measures were stringent during the event, with military and police patrolling areas around Sanam Luang. The Interior Ministry yesterday brought 3,000 people from Uttaradit, Lop Buri, Nong Khai and Samut Prakan to pay respects to the King. The Ruam Duay Chuay Kan Sam Nuek Rak Ban Kerd Foundation brought 101 Paka-Kyaw Karen hilltribe people from tambon Na Sai of Lamphun’s Li district to pay homage to the King. This was part of the foundation’s activities to bring people living in areas developed under the royal projects to pay their respects. To better manage the arrival of mourners, the government’s peace command centre sought cooperation from the Interior Ministry to keep people suffering from congenital and communicable diseases out of the groups it will bring to Sanam Luang. The Public Health Ministry has also been contacted to send provincial medical teams to take care of people travelling to Bangkok. Siriraj Hospital and the navy held activities yesterday to honour King Bhumibol at the hospital’s statue of Prince of Songkla, Mahidol Adulyadej the Prince Father. Activities included performances of music written by the King as interpreted by the Royal Thai Navy Orchestra. The Thai Journalists Association also held an event to pay tribute to the King.